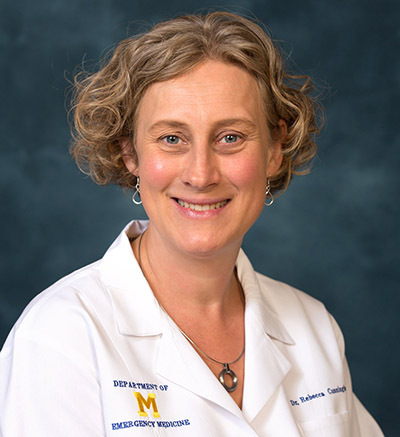 Rebecca Cunningham is an emergency room physician at the University of Michigan with an expertise in substance abuse in an emergency setting. The views expressed are her own and do not necessarily represent her employer(s) or affiliated organizations. As an emergency physician, I am often faced with a waiting room full of patients seeking relief from their pain. Recently, I met a woman, who I’ll call Nancy. I did not recognize Nancy personally, but her demeanor and personality made me feel like she could be my friend or neighbor. Nancy came to the emergency room complaining of excruciating pain in her leg. She was cordial and kind and considerate of the treatment options I provided her. When I was preparing to discharge her, she requested a prescription for a narcotic medication to treat her continued pain. Based on my interactions alone, I did not suspect she was attempting to obtain a prescription for misuse. The data, however, suggested, otherwise. Before prescribing pain medication, I performed a routine query on Nancy in the Michigan Automated Prescription System (MAPS). As a personal rule, I universally review the MAPS system prior to writing all narcotic prescriptions. To my surprise, I learned that Nancy had recently received a prescription for 30 tablets of oxycodone filled within the past seven days; she had obtained over 20 prescriptions for narcotics from at least four prescribing physicians within the past 12 months. Nancy displayed classic signs of “doctor shopping” ‒ the practice of obtaining narcotic prescriptions from multiple providers rather than one provider who could manage her pain adequately and ensure that she wouldn’t develop a substance use problem. The State of Michigan’s new MAPS system flagged this concern with overwhelming evidence, making it easy to identify the potential problem. Based on this information, I was able to ensure that Nancy left the emergency department, not with another prescription for Vicodin, but with a referral for substance use treatment. MAPS is a vital tool that equips physicians with real-time patient data and recent drug request history. MAPS provides data on patients and prescribers and dispensers of potentially harmful schedule II-V drugs. The data in MAPS rely on the collective. When all health providers prioritize the use of MAPS to improve patient care, the aggregate data develops vital momentum to curb overprescribing to potentially vulnerable patients. That’s why I supported recently passed state legislation which requires health care providers to check MAPS when prescribing more than a three-day supply of a schedule 2-5 controlled substance to a patient. Without MAPS, I may have inadvertently furthered Nancy’s path of addiction and substance misuse. When we as physicians choose only to check MAPS on patients we feel are at high risk according to their medical history or exam ‒ we risk our own implicit bias driving our prescribing practices and, in doing so, put our patients and the community around our patients at a greater risk. To avoid this, a good practice is for physicians to check MAPS prior to prescribing discharge medications to patients. The opioid epidemic in our communities does not discriminate by race or socioeconomic status. I have seen firsthand that this medical illness affects everyone ‒ rich, poor, rural, urban, educated and uneducated, young adolescents and elderly adults. Quite simply, utilizing MAPS for all patients ensures the best possible treatment that is both compassionate and data-driven. Michigan’s new and updated MAPS system will only be effective if it is utilized universally by the physician and health provider communities. The use of objective data is the only way we as physicians can do our part to inform safe prescribing practices and reverse the opioid epidemic in Michigan. Too busy running their offices like a Car Wash. In Out and more pills. Primary pill push. Healthcare biggest problems are poor Doctors. Money First and 10 minutes of services. The joke is on us, we allow it. Is there provision in the law to monitor physician compliance with the law? There should be correspondence between the the date a physician writes a prescription and the date that he/she checks the MAPS system. Is there a way electronically to notify a pharmacist that he/she should not fill a prescription because the physician did not check the MAPS system? Maps is a great tool but very misleading!! In my case, i went to my family physician for chronic pain.., over a course of two years these phyaicoans kept quitting, leaving me to find another family physician. My maps record looks like i was doctor shopoing when, in fact, i HAD no choice but to find a new physician to continue treatment. As a result of this one size fits all reporting system, i look like a drug seeker! Yes, that is the other side of the coin! Patients who really need the stuff can't get it. I have long periods of work abroad and could not receive the medication that I (fortunately) do not need (yet! I am 70 with a l.t. muscle tear and decided to toughen it out). The REAL issue is: how do we weigh things when deciding between folks who have no self control and people who happen to need the med's! Whose needs take preference???? GD- addiction is not a lack of self control- it is a disease that requires treatment. We cannot solve this problem if we continue to view addiction as a moral failing. In addition, the topic of 'need' is also interesting. There is quite a lot of research that supports the fact that narcotics do not provide better pain relief for many types of pain than other types of pain medications (such as NSAIDs) or non-medication approaches. There is a lot for all of us to learn in order to address this public health issue. Couple of observations. I believe new legislation just recently signed into law requires physicians to check the MAPS record of a patient prior to writing a narcotic prescription for them.. Failure to do so does carry a penalty for the physician. The current opioid use epidemic does have a racial overtone. According to national date collected over several years there is a disproportionate impact of the epidemic on the Caucasian population. This appears to be a result of a greater reluctance on the part of physicians to write narcotic prescriptions for people of color. Relative to the comment about running an office like a car wash. The onus for this is less on physicians than their employers and insurance companies. The issue is complex and multifaceted but a major objections many physicians have to the economics of the current medical care delivery system is the pressure to see more patients in order to meet productivity requirements. Over the course of the last nine years, my husband has had to have six surgeries, four of them serious, or major surgeries, if you will, and two of them outpatient minor surgeries. I have become very familiar with the prescribing of opioid medications, and I still don't understand it. In the hours or days that my husband was post-op in the hospital, he was given pain killers such as morphine and morphine derivatives, intravenously, by injection and by mouth. Doctors prescribed opioids to be taken at home after every surgery, regardless of the severity of the surgery. When we objected to this, because he had already had so much narcotic pain relief in the hospital, and because they really don't help with average sorts of post op pain, the doctor in some cases exhibited what must be termed a low level frantic insistence that my husband would have pain and would need these drugs. Well, with all of these drugs that we took home with us, he only took them one time, for some truly hideous pain that he was experiencing, and even then, he only took a few, when the pain was truly awful. He knew immediately when he wanted no more of the stuff--he began experiencing feelings of sadness and depression, something that he never does normally. So, each time, I was left with full bottles of this stuff, to get rid of. Until three or four years ago, there was no where to take it and no one to give it to. After one major surgery, with everyone I asked refusing to take this stockpile of dangerous narcotics back, in exasperation, I finally took the stuff back to the prescribing pharmacy, and when they refused to take it back, I left it on their counter. Now, the VA and most police departments will take these drugs back. In every instance, what worked completely successfully for my husband's surgical pain was a combination of acetaminophen and ibuprofen. Pharmacists know how these drugs should be administered and they will help you with the dosing and timing. One of my husband's surgeries was for severe elbow breakage after a fall from a ladder. The elbow was shattered in the fall and then wired together for healing. Two of the other surgeries were shoulder replacements. So, you can see that these are major surgeries that will cause a substantial amount of pain. Yet, common, readily available over the counter medications worked just fine for his pain control. After all, the opioids like hydrocodone were developed for pain relief that comes with late stage inoperable cancer. Not an arthroscopic knee surgery. So I am left with two dilemmas. Why do doctors turn to this stuff instead of something non habit forming, and why do you form a habit to it? My husband said that stuff was bothering him and never took another one, never even gave it a thought. The entire opioid problem has overarching reasons for its existence that completely escape me. Your husband is fortunate that over-the-counter meds work for him. That's not true for everyone. There's no one-size-fits-all solution for pain. People experience it differently based on a lot of variables. As a patient that just had to go in for ADD Medicine (Schedule 2) I understand why this is being done, however I have just one major issue with MAPS -- Patients CANNOT access the system to see what their record holds. We have no way to see if there is incorrect data, no way to see if someone is getting drugs in our name, etc. Doctors can review MAPS reports with patients, but I very much dislike a compulsory database filled with my personal and sensitive information, that I have no access to view. Finally, in all likelihood I will be on this medicine for the rest of my life, and now I have to see the doctor 4 times a year (incurring a cost of over $400, plus my already $150-$300 a month cost for the medicine itself) which puts a burden on me as a patient. For those saying insurance covers visits, I can only afford a basic insurance offered through work, and it is a deductible prescription plan, so I pay out of pocket.